This template was submitted by Lam Tuan Anh from Vietnam. 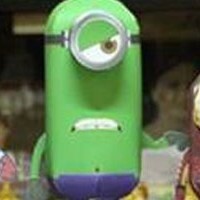 Purple minions are appear in Despicable Me 2 movie. 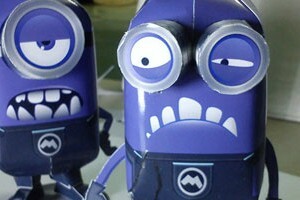 These charaters originally are ordinary minions, they are mutant minions. Unlike original minions, they are evil and ugly. The template is still using original pattern so the assembly instruction is still the same as the original. In the movie purple minions come with purple big hair, this template is not provide any hair part, it's a chance to make it your own hair style. This pattern was submitted by Edgardo Rivera. 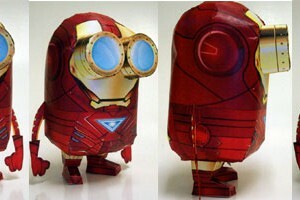 After Captain America now he shares with us his new work, Iron Man Mark VI version of minion. The pattern is a modification, custom redraw from Paper Replika's Despicable Me Minions paper craft. This one sheet pattern originally was in bitmap format then I convert it into PDF but still in bitmap PDF not vector. There is no assembly instructions, but you can figure out yourself easily or you can open the previous Minions page for additional help. This model was submitted by Nanda Blank, he create this Krusty Krab paper model template using Google Sketchup 3d modeling software and Pepakura Designer. 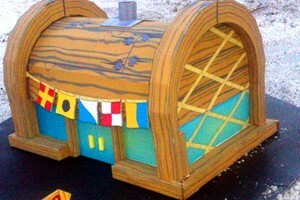 As a SpongeBob SquarePants fan he never found any of Krusty Krab paper model anywhere, so he decided to make that Krabby Patty restaurant as his first paper model template. The template contains 4 pages of patterns and 1 page of assembly instructions with photos as additional guidance.